Last year, we watched the Barefoot Contessa make chocolate cupcakes with peanut butter icing and thought it was a brilliant combination. We actually made them for dessert in our first post (scroll down) on the site. They were a big hit, so we made them again this past Sunday. 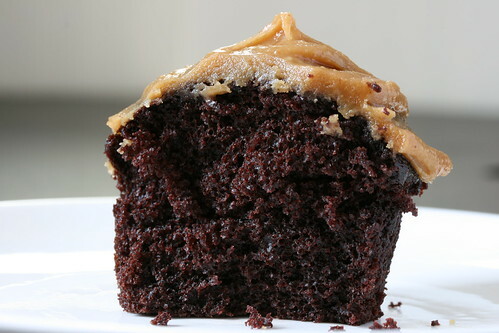 Although we loved Ina's union of chocolate and peanut butter, we thought her cupcake recipe had too many ingredients. I'm sure the cake part tastes great, but we would have bought sour cream and buttermilk, used half, and eventually thrown the rest away. Instead, we turned to one of our favorite chocolate cupcake recipes by Gale Gand (BTW, her fudgy frosting is killer). We love the simplicity of the cupcake batter... no eggs, no butter, no mixer required. For the peanut butter frosting, we reduced the sugar and butter, because we don't like overly sweet icings and there's plenty of creaminess from the peanut butter. The final change was the substitution of coconut cream for the heavy cream, since we had already opened a can of coconut milk for a morel sauce that evening. The cupcakes were scrumptious with a moist and tender cake. The frosting had a great peanut flavor and wasn't too sweet. We had the SNDsters top their own cupcakes with cacao nibs and M&M minis. And once again, they were enjoyed by all. As we discussed the modifications and ingredients with the SNDsters, we realized that the cupcakes were almost vegan. I believe the only thing you need to do is substitute margarine for the butter. Since the peanut butter is so creamy, I don't think anyone would miss anything. If you do make these as vegan cupcakes, let me know how they turn out. SND Note: The original peanut butter frosting recipe called for 1/3 cup heavy cream. The last time we made the frosting we reduced the cream per our usual MO. This time we replaced the heavy cream with coconut cream. Coconut milk separates into two layers when stored undisturbed in a can. The bottom layer is a thin milk and the top is the thicker coconut cream. Preheat the oven to 350°F (177°C). In a large bowl, whisk together the dry ingredients. In a large measuring cup combine the water, oil, vinegar, instant coffee, and vanilla. Whisk it into the dry ingredients until just combined. Don't worry if there are a few lumps. Line 2 muffin tins with cupcake liners and fill each 2/3 full of batter. Bake until wooden skewer comes out clean from the center, about 25 to 30 minutes. Cool the cupcakes completely before frosting. Ice each cupcake with peanut butter frosting and sprinkle with favorite toppings. Place the confectioners' sugar, peanut butter, butter, vanilla, and salt in the bowl of an electric mixer fitted with a paddle attachment. Mix on medium-low speed until creamy, scraping down the bowl with a rubber spatula as you work. I love chocolate and peanut butter together. Your cupcakes turned out so beautiful! the cupcakes look yum-o but what i was drooling over, still, was your oven. and does your muffin tin really stay that clean when you’re baking? because when i bake and i’m pouring batter, it lands everywhere! i agree that Ina’s recipes sometimes has ALOT of ingrediants. Re-thinking having bookmarked your site, Mr. Sunday Night Dinner Guy! A few more drool-inducing recipes like this will wreak complete havoc with my willpower!! I made Ina’s peanut butter frosting before and it was devastatingly divine. I don’t know about her recipe for chocolate cupcakes but you should give the frosting a try. I tossed some reese’s peanut butter cups in with them and I think I died and went to heaven. Aww! Those look like m&m cookies on top of cupcakes. So tasty looking! Patricia, thanks! Peanut butter frosting is the best. Lan, normally my muffin tins are a complete mess. But with the new kitchen, I was being extra careful not to drip anywhere. We’ll see how long that lasts. Caroll, so sorry to test your willpower. A strawberry kuchen recipe is next and it’s fantastic! Amanda, the peanut butter frosting is actually based on Ina’s recipe. We just modified it slightly. I like your idea of adding Reese’s peanut butter cups. Sounds decadent! Tarah, thanks! The M&M minis was my favorite topping, yummy and colorful. i made these cupcakes vegan just by substituting earth balance for the butter in the frosting. they were absolutely marvelous. i used scharffen berger cocoa powder so that the chocolate really popped. it worked. i took ’em to a bbq, didn’t let on they were vegan, and they went like hotcakes. OK, how could I have not thought of this! Brilliant! These look awesome! Please consider entering these in Peanut Butter Exhibition #3 Cake/Cupcake hosted by me and The Peanut Butter Boy. can i check with you the cocoa powder used here is dutch processed or natural? Thanks! I have now made these cupcakes (not the frosting) twice and both times they have been simply amazing!!! I foolishly never read the recipe properly when I wrote it down because half way through I was like ‘how many eggs do I use……oh erm I forgot to write that down’ and had to come back to the recipe and then did the same with the milk. It then suddenly dawned on me ‘eh doh…….they are vegan’ which I would probably have avoided had I known (silly me) but since I was already half way through I thought what the hell. Well I can say this…..I will NEVER use another chocolate cupcake recipe so long as I live – that is how good they are. They rise perfectly in the oven and I think that the water instead of milk means that the cakes are steamed in the oven and this makes them so moist and yummy! I have one question…….I love this recipe so much that I feel there has to be a vanilla cupcake equivelant?? I mean this in the sense that surely you could just omit the cocoa, maybe a touch more flour to compensate????? Do you think it would be that simple?? If no one knows, then I’ll try it, but just wanted to see if anyone would see there being an issue? Anyway, thanks for the recipe, its brilliant! What do I substitute the coconut cream with? Or can I simply just take it out? Thanks for the recipe, the cup cakes turned out good. However, the addition of vinegar didn’t work well for me, although the texture was fine. Dunno what went wrong?Could u pls lemme know if there is a substitute for vinegar? Brian, before you resort to childish name calling, you may want to learn how to read! The no mixer required in paragraph 3 was in reference to the cupcake batter, which does NOT use a mixer! So, who is the jackass now? I didn’t like the cupcakes because I don’t like peanut butter and/or chocolate, but everyone at my wildlife rehabilitation center did. The cupcakes rose very well, and the frosting spread very smoothly. The cupcakes also had a firmness to them, but not like a rock. They took the frosting well. I put them in the oven at 350 F for about 25 minutes. I think that agave syrup might be really good drizzled on top of the peanut butter frosting, but who knows! Thanks for the recipe. Oh! M&Ms are most definitely not vegan. They contain many dairy products but I also believe the company who distributes them tests their candy on animals (the gruesome bloody kind). Anne, thanks for making and posting your vegan recipe! And thanks for the heads up on the M&Ms. What is your preferred chocolate brand that you can suggest for the best tasting chocolate cupcake? I have tried both Ghirardelli and Nestle for the chocolate chips and Hersheys for the cocoa powder. They do not seem to have a lot of difference. I made these muffins this evening and let me tell you they are fantastic!!!!!!! They are the first chocolate muffins I have ever made – and I will not bother trying any other recipes because these were perfect. They are moist, with a thick fluffy texture, and a nice dark brown colour. Everything you want in a muffin! They rise well so don’t fill them too much. I filled mine 3/4 full and this was perfect. I baked mine for 25 minutes. They came out with a firm crust on the top – not crunchy or anything – just firm. I may try cooking them for a minute or two next time to see if that makes then softer. I also found that they stuck to the bottom on the cupcake liners. I have had this trouble with cupcakes before and what I normally do to solve this problem is that when I line the tin with cupcakes liners, I lightly butter the insides of the liners before putting the cupcake batter in. This helps to prevent them from sticking. But do NOT let this put you off baking the muffin because the problem can easily be solved and it is well worth the extra effort – I promise! I frosted mine with a small amount of chocolate frosting – icing sugar, cocoa, a small amount of butter and a little water for desired consistency. Perfect muffin – don’t look any further! This morning the muffins are absolutely beautiful!!! There is no longer a firm top on the muffins, instead they have a glossy finish and are soft to the touch. They are no longer sticking to the bottom of the cases either. So – officially no complaints! Before i could even comment, the “chocolate Cupcake” photograph looks so amazing, i just feel like grabbing and swallowing it at once. ha-ha. yummy! :) but anyways, awesome recipe and I’ll just go now and prepare and get back to you with an update about how it turned up! Thanks for reading. If you do not have a lot of time to spare, pre-prepared dishes from local grocery stores are a great way to serve tasty food without spending a lot of time. Can you tell me the difference between all purpose flour and cake flour? I’ve been doing a lot of baking recently and want something that will make my creations as “light” as possible. These cupcakes are the best! Made them for my sons birthday party and everyone loved them. 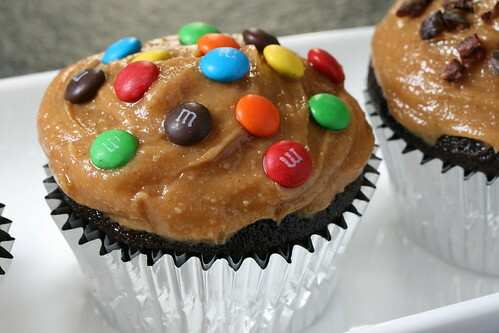 OMG, the chocolate cupcakes with peanut butter sounds and looks awesome. This recipe will tried within the next week. I’ll update you all with my findings. Hope it tastes as good as it looks. Is there any other chocolate brand that you can suggest for the best tasting chocolate cupcake? I have tried both Ghirardelli and Nestle for the chocolate chips and Hersheys for the cocoa powder. They do not seem to have a lot of difference. Email addresses are never published. Comments are editable for 15 minutes after submission. Basic HTML can be used, e.g. <strong> <i> <em> <strike> etc. Gravators (globally recognized avatars) are enabled. Sign-up at Gravatar to display your avatar on SND and other sites.